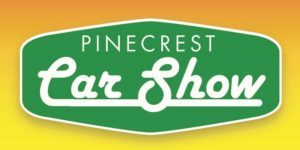 Pinecrest Car Show Saturday, April 27, 11:00 a.m. to 3:00 p.m. | Suniland Park The Pinecrest Car Show is a FREE community event sponsored by Williamson Cadillac featuring antique, muscle and super cars as well as delicious burgers by Shula Burger! Bring the whole family to see the collection and meet like-minded car enthusiasts. 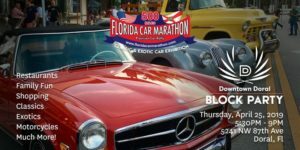 To register your car, complete this FORM and email it to dalberty@pinecrest-fl.gov. 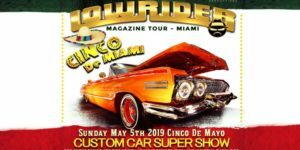 The 4th annual Miami Lowrider Custom Car Super Show rolls into the Miami-Dade County Fair and Expo Center, SW 107th Ave and Coral way, Sunday May 5th, Cinco de Mayo!! 11am - 7pm Rain or Shine. The 2019 Show will feature hunderds of the baddest customized cars, trucks and bikes on the planet as well the world famous hydraulic car hop competition! Come celebrate Cinco De Mayo with the whole family! 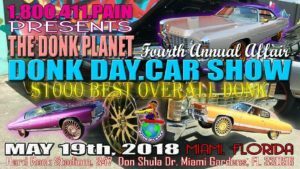 The 4th Annual Donk Day Car Show.